In the spring issue of Fly Rod & Reel, I extolled the virtues of western bass and offered a little kick in the backside to say that if you are only fishing trout and not taking advantage of bass, you just aren’t having as much fun as you could. That’s because the West is loaded with bass and they don’t see the pressure that fisheries in the southwest, midwest and east do. 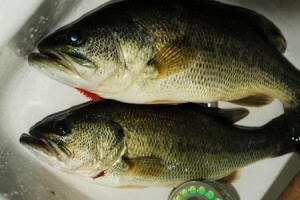 And there are some toads to be had—five pound largemouths abound and five-pound smallmouth aren’t too uncommon either. To back up my assertion, I direct you to a recent article offered by Bassmaster.com, in which Idaho’s Dworshak Reservoir and Washington/Oregon’s Columbia River are listed as two of the top bass fisheries in the nation. We covered the Columbia River in FRR’s pick of the best western bass fisheries and I wanted to include Dworshack in the mix, but couldn’t find a writer who knew the fishery well and could pen the piece. This, too, backs up the overlooked aspect of the article we ran in FRR. Really? Can’t find a writer to detail a fishery that booted out a 9.72-pound smallmouth bass in 2006? A fishery that bangs out four-pounders like candy? Attached you’ll find a link to the Bassmaster.com site. The teaser below is credited to Columbia Basin Bulletin. Of the thousands of fishing holes across the nation, two locations managed by the U.S. Army Corps of Engineers’ Walla Walla District made the Bassmaster Magazine Top-100 list of best places to fish for bass, according to an April 24 release by B.A.S.S. Communications. This entry was posted in Idaho, Industry, Warmwater, Washington and tagged Bass. Bookmark the permalink. Thanks for sending the link. I agree with that post 100 percent. We’ve f’d things up so bad that it makes me sick. Can we get rid of the bass at this point? Probably not. Do I wish we could? Oh yea, I do. I wish we could get these WILD salmon and steelhead runs back in order. I wish we could get that North Fork race of steelhead back in Idaho. I could lament until the day I die or I can take advantage of what is there and have a good time with it. So, again, yes, I think the bass shouldn’t be there and it’s a tragedy that they are. But, I’m always trying to turn a negative into a positive and if the bass are there, I’ll throw. Thanks agin, Greg. Just what the fly angler needs, a good ole’ fashioned dose of “bassification”! That is if Greg in Switzerland doesn’t trademark the term first. Which he should. Thanks MG. I am definitely seeing through the trout tunnel these days and taking care of all opportunities. Pike may not feel safe much longer.